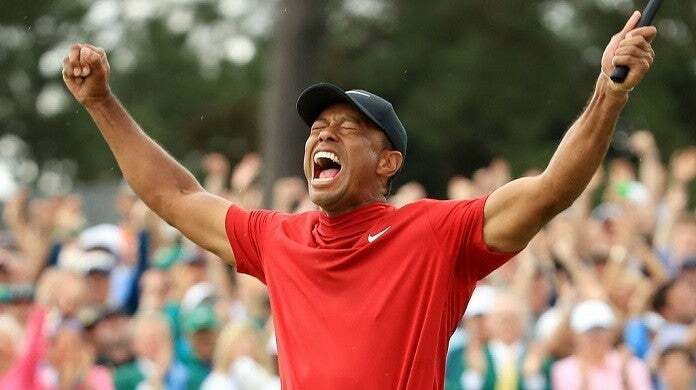 Tiger Woods winning a golf tournament used to be a sure bet, but that was years ago, meaning that one person who still believed the legend could win his first Masters tournament since 2005 got a huge payoff. Woods, 43, was considered one of the top contenders to win the green jacket at Augusta National thanks to his more recent success in other tournaments, with 12-1 odds. According to ESPN, a bettor at a William Hill U.S. sportsbook at SLS Casino in Las Vegas put down an $85,000 bet on Woods to win with the odds at 14-1. The customer, making a first-time bet with the firm, will get a $1.9 million pay out, the biggest single golf ticket in the William Hill U.S. history. "Pretty good first bet," Nick Bogdonavich, the William Hill U.S. director of trading, told ESPN Sunday. "It's great to see Tiger back... It's a painful day for Walter Hill — our biggest loss ever — but a great day for golf." William Hill U.S. said this is the fourth seven-figure payout for William Hill U.S. The first three were all paid out after the Philadelphia Eagles beat the New England Patriots in last year's Super Bowl LII. William Hill U.S. is not the only sportsook hurting. The SuperBook at Westgate Las Vegas said it lost a high five-figure amount on its Masters futures. SuperBook vice president of risk Jeff Sherman, who is also a golf odds specialist, told ESPN he did not know the last time SuperBook was dealt that big a loss from The Masters. The SuperBook took a $10,000 bet on Woods winning The Masters back in February at 12-1 odds. That will pay $120,000. "I thought he had a chance to be competitive, but I'm a little surprised by him winning, especially with the competition he faced. I said before the tournament that if you took the 'Tiger Woods' off, you'd have a golfer with the statistics of someone at 25-1 odds," Sherman told ESPN. Caesars Entertainment sportsbooks claimed it actually had a small win on The Masters. Its biggest win came when someone put up $20,000 against Woods winning all four majors at -100,000 odds. If Woods does not win any of the Open Championship, PGA Championship and U.S. Open, the bettor will take home just $20. FanDuel said it will pay out over $2 million in winnings and $1 million in promotional refunds from a Mega Eagle contest, while BetStars sportsbook in New Jersey reported a $360,000 loss. Woods won The Masters with a 2-under-par 70, finishing two shots behind Francesco Molinari. It was Woods' first major championship since 2008. It was his fifth Masters win and 15th major championship overall. He won the U.S. Open and The Open Championship three times each, and the PGA Championship four times.